EURO-COOL shell & tube glycol chiller is flooded ammonia design. The package complete with a shell & tube heat exchanger, glycol pump(s), a horizontal accumulator with dual relief valves, level indicator column, float switches, and all necessary valves for operation and maintenance. The Package shell and Tube Glycol Chiller composed of two chillers and a surge drum. Each chiller contains a glycol substance circulating inside the tube. Having an inlet temperature of 3 ℃, glycol will ow through the tube while the tube’s external structure bathes in the liquid ammonia. Consequently, heat exchange happened by the process of conduction can enhance the cooling effect of the glycol. The glycol exits the tube with an outlet temperature of -2 ℃ which then directly ows to the unit cooler. Eventually, cool air is produced. 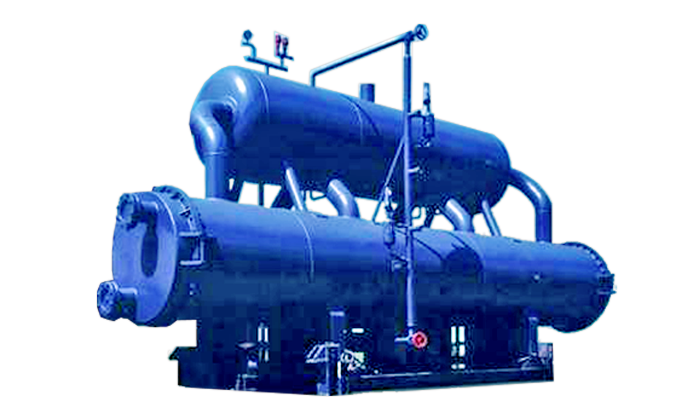 Also, the surge drum, which is attached on top of the twin tube chiller, consists of liquid and ammonia gas. By the virtue of gravity, liquid ammonia ows down to the chiller tube while the gas is suctioned up directly. It will then move up to the compressor. Shell & Tube Glycol Chiller is widely employed in various food and beverage industries, hospitals, pharmaceutical industries, and etc.